If you’re searching for heating solutions for your home, you’ll want to look into the best baseboard heaters. Opting for these devices is an excellent move since they’re easy to install and maintain and don’t require ductwork (a huge plus if you live in an old home, which doesn’t easily accommodate ducts). They also release warm air evenly instead of on an intermittent basis like what forced-air systems do. One of the best things about this model is that it has a smooth and quiet operation, which makes it ideal for bedrooms since it doesn’t have any loud noises that can wake you up. It comes with a durable case that has been pre-punched at 1-inch intervals, making it easy to install even when you’re going the DIY route. The case has a smooth, powder-coated paint finish that makes the device look good and allows it to integrate well into your existing baseboards. The 240-volt, 1,500-watt 09956 is another excellent offering from Cadet. It’s made of 25-gauge steel and comes with a 20-gauge metal power-coated junction box with ground. The heater measures 72.3 inches by 4 inches by 7 inches and weighs less than 14 lbs; since it’s UL listed, you have the assurance that its electrical system has been tested and inspected by experts. If you’re looking for a heater that doesn’t consume too much energy, you’ll love the King 3K1207BW. It uses only 750 watts of power while heating up to 75 square feet of space, making it an energy-efficient and cost-efficient option. Its 3-foot length and wall-mount design, meanwhile, make it an excellent choice for small rooms that don’t have much space to spare. It comes with chimney style fins that are made of aluminum and are designed to evenly distribute heat in your room. This baseboard model provides worry-free heating around pets and kids thanks to its hydronic design. 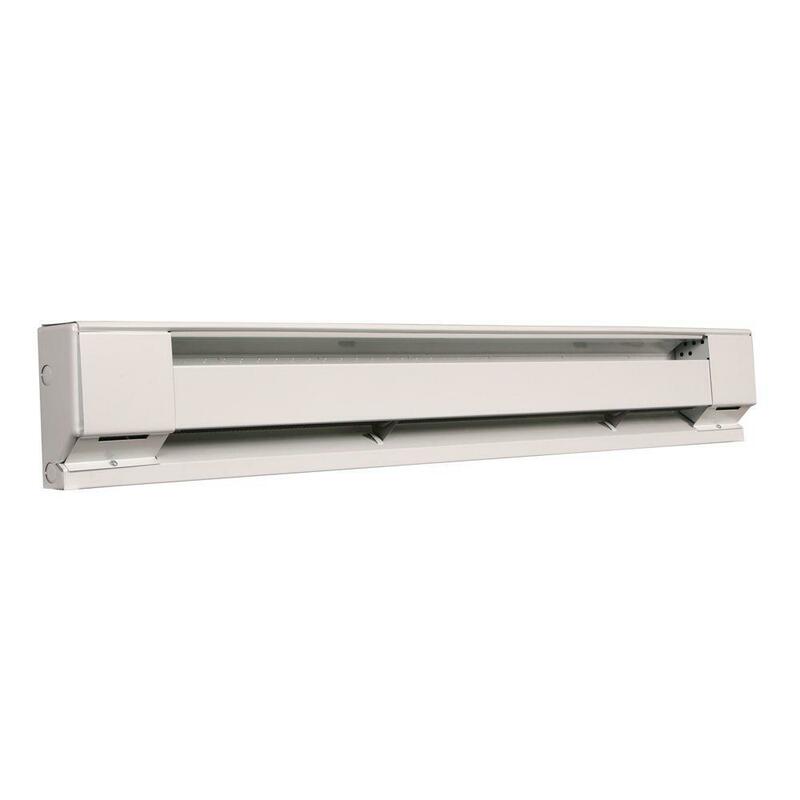 The surface of the unit stays cooler to the touch while still providing reliable radiant heat. This convection heater starts up and stops without the disruptive popping or pinging sounds given off by traditional baseboard models. 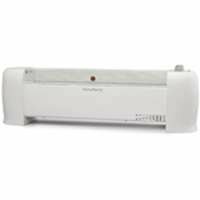 Keep dust and other particles from circulating, thanks to this hydronic baseboard heater's fanless operation. With no blower or exhaust fan, allergens and dander won't be blowing around the room. 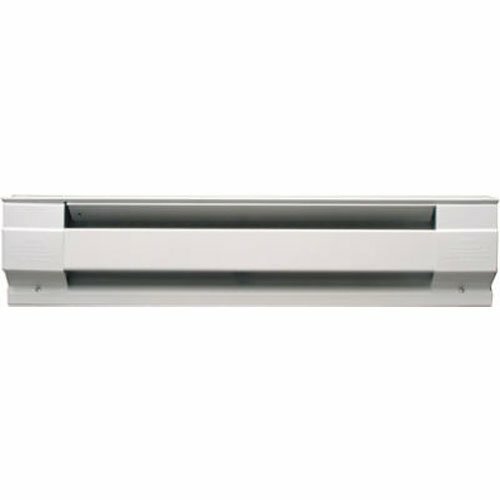 Keep the room comfortable and reduce unnecessary on/off cycles with this unit's up to 100% energy-efficient design. For worry-free warmth, the unit's overheat protection feature prevents the heater from running when its air intake is blocked. The PLF1004 is UL-listed for floor mounting, which means you can install it right over any kind of floor tile or even carpet. It’s built with a thermal cutout, which automatically shuts off the device in case an accidental air blockage occurs and prevents further damage. The heater’s off-white finish and contemporary design makes it an attractive addition to any room and allows it to complement almost all types of interior décor. The LH844 is built with a tip-over safety shut-off and emergency power down controls, which means it’s safe to use in your home and won’t suffer from damage in case of sudden blackouts. It has a low-profile design that allows it to subtly blend into your existing décor and avoid sticking out like a sore thumb, and it has adjustable temperature settings so you can choose the heat level that best suits your preferences. Browse through the best baseboard heaters now to choose the right make and model for your home!